Must be Special Summoned (from your Extra Deck) by banishing the above cards you control, and cannot be Special Summoned by other ways. (You do not use “Polymerization”.) Once per turn: You can target 2 of your banished “Ritual Beast” cards; return them to the Graveyard, and if you do, add 1 “Ritual Beast” card from your Deck to your hand. During either player’s turn: You can return this card you control to the Extra Deck, then target 2 of your banished monsters (1 “Ritual Beast Tamer” monster and 1 “Spiritual Beast” monster); Special Summon them in Defense Position. Representing Ritual Beasts is a card that is limited for some unknown reason as the deck wasn’t topping too much when it was limited, Ritual Beast Ulti-Cannahawk. 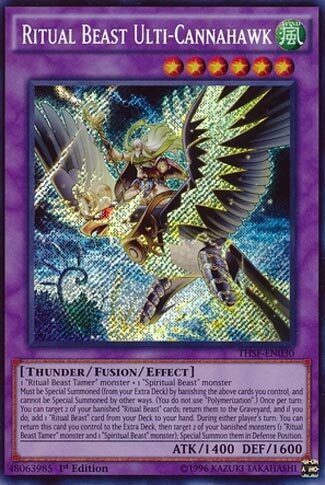 Ulti-Cannahawk is a Level 6 Wind Thunder Fusion with 1400 ATK and 1600 DEF. Horrendous stats, but this doesn’t stay on the field long. Type is very undersupported, attribute as well, Level is not relevant here. This card is a Contact Fusion, one of the best kinds, that can be summoned by banishing a Ritual Beast Tamer and Spiritual Beast. Very easy to do with the Ritual Beast theme, despite all of the main deck monsters only being able to be Special Summoned once per turn. Once per turn, you can target two banished Ritual Beast cards, return them to the GY and search for a Ritual Beast card. A good searcher, the banished pile for Ritual Beasts fills up quickly. A popular search option would be Ritual Beast Steeds, Ritual Beast Ambush, or another monster to summon. Thankfully to rulings, only one card has to return to the GY to get a search for this guy, and that is great because this card can return to the Extra Deck to summon a banished Ritual Beast Tamer and Spiritual Beast monster, so target two monsters, then summon one of the monsters you targeted and a different monster to bring back while the other card returns to the GY to get your search. Outstanding card in the Ritual Beast deck, but still odd it is at one. Lose this and you struggle to gain advantage in Ritual Beasts, yet you must play every copy allowed because the card is that great. Been playing the game since about 2006 and had a ton of fun along the way. If you wish to contact me, you can email me at iphoneperson@icloud.com or crunchg9@gmail.com to ask me anything or if you simply want to discuss Yu-Gi-Oh.